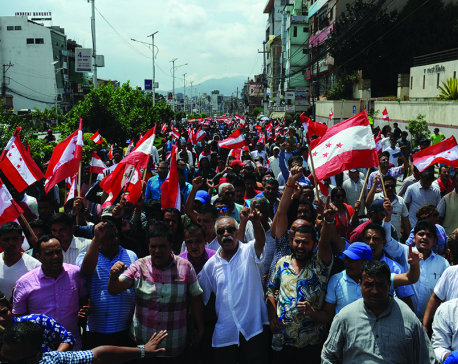 In 2013, just before the second Constituent Assembly elections, when various Janajati movements such as Limbuwan and Tamsaling had gained tremendous momentum, Nepali Congress leadership opposed the idea and preached like liberal democrats. Their argument was that in a multi-ethnic, multi-religious, multi-lingual and multi-cultural country like Nepal jaatiya rajya, ethnic state, was a tribalistic idea and that we are all Nepali first and only then Gurung, Tharu, Khas or Madhesi. Three years after endorsing a secular republic the same leaders are showing ‘double standards’ and hypocrisy. They seem obsessed with and regressing toward Hindu statehood from a secular republic. Interestingly, the same politico-moral reasoning of 2013 can be applied today: In a multi-ethnic, multi-religious, multi-lingual, multi-cultural country like ours ‘dharmik rajya ’ or religious state is a medieval idea and that we are all Nepali first and then only Hindu or Buddhist or Muslim or Christian. Congress leaders, however, don’t care. Those who were opponents of identity movement five years ago have turned supporters of identity politics now albeit for a different cause. Ironically when it serves their narrow self interest, the same supposedly liberal democrats have turned conservative. In a diverse country like ours, if identity cause on the basis of ethnicity is a taboo then identity politics on the basis of religion is as much a taboo. It is no surprise that Hindu fundamentalist and pro-royalist outfit like RPP is rooting for this regressive idea, but it is alarming that such views are coming from a supposedly centrist and liberal party like Congress. Nepali Congress claims to be the oldest democratic party with ‘socialism’ as its pillar ideology. 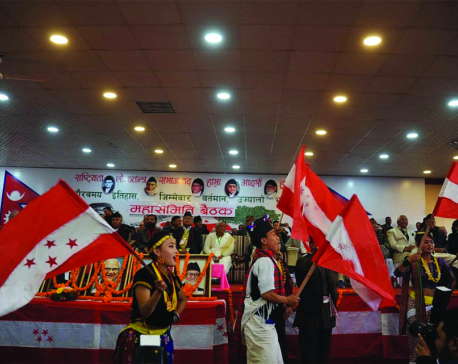 However, with its right wing hindutva leaning, they might as well remove ‘Nepali’ from the party name and rename itself as ‘Hindu’ Congress because the adjective ‘Nepali’ signifies more than 123 richly diverse communities reflecting numerous ethnicities, religions, languages, cultures and perceptions from Himal and Pahad to Tarai. A party that no longer has the moral courage to pursue a liberal, inclusive, pluralistic, modern, secular democracy does not have any right to define itself as a pan ‘Nepali’ entity encompassing rights and representations of all Nepali people of different faiths, creeds and backgrounds. The silence and lack of courage of its moderate, secular minded liberal leaders to oppose Hindutva leaning at the recently concluded Mahasamiti Meeting is perturbing. I wonder if they have any liberal leaders with secular views supporting modern republic with pluralism. The founding fathers of Nepali Congress like BP Koirala and others always took political inspiration from Indian National Congress under Mahatma Gandhi and followed the ideals of Satyagraha—force of truth—and ahimsa—non-violence. Never did Indian Congress preach hindutva in the Indian republic. In fact, Gandhi was killed by a right wing Hindu fanatic. The Indian Congress has always stood for a secular republic although the country was torn apart on religious lines. Nepali Congress at the moment seems to have given up on those ideals. It is taking ideological inspiration from the likes of Rashtriya Swayamsevak Sangh (RSS), Vishwa Hindu Parishad and their protégé BJP in India. 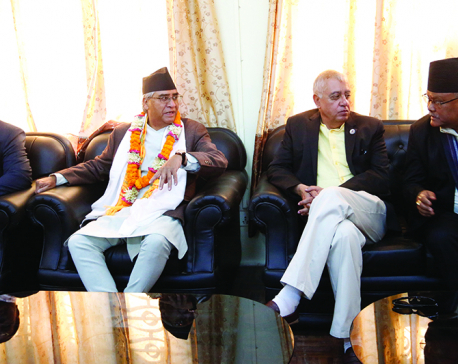 In the long term, Congress risks losing its position as the mainstream pan ‘Nepali’ political party if it leans toward right, leaving its moderate centrist path. No matter how democratic the right wing fundamentalist or the leftist communists claim to be, the mass will always be skeptical to both these ideological spectrums and ultimately prefer a centrist moderate party in the long run. Historically, Hindu monarchy in Nepal always followed official single identity statehood on language, religion and culture for 240 years. Conservatives in Congress are wrongly carrying this legacy. This mindset is against the ideals of a secular, inclusive, pluralistic modern republic. Hindu rashtra ideologues have also spread false and misleading propaganda. They have been putting the blame on secular state for conversion. This is an utter lie. There has to be effective laws banning sponsored conversion by individuals and organizations. The state has to monitor exploitation and luring of poor and illiterate people by religious organizations. But freedom of religion and equality of all faiths practiced in the land should be guaranteed. The minority Christian Nepali community must be allowed to follow their belief without intimidation and they should not be demonized because of ill-intentioned conversion efforts by some groups. In the last 70 years, if secular state had diluted the identity of Hindus in India then global Hindu community would not be poised to reach 1.5 billion by 2050, second only to Islam by that year. Secularism neither favors nor disfavors any religion, whether that of a majority or that of any minority. Thus it is disgusting, absurd and misleading of some Congress leaders to criticize secular state and praise a sectarian ideologue that exclusively favors one religious community. This is like making a blind man hold the elephant’s tail and making him believe that it’s a snake. The liberals, moderates and youth leaders in Congress must safeguard their party against the communal, sectarian allure of right wing hindutva ideology. Or else, the party will shrink and downgrade from a mainstream pan ‘Nepali’ centrist political organization representing all faith followers in the country to a myopic, constricted right leaning party representing only one segment of the society.